How Will History Judge Bush? But my friend can point to academic support for her claim, because even some historians, who should know better, have been eager to label George W. Bush the “worst president in history.” They would do well to let some history occur before they presume to speak for the ages, and to remember how Ronald Reagan evolved in a few short years from the bumbler of the Iran-Contra scandal into the hero who won the Cold War. As Professor Moen points out, Bush’s “ability to actually stay convinced that Iraq had to be won, when nobody else in the world agreed with him…is an aspect of his strong leadership that people will respect more over time.” One can argue that when Bush leaves office, Iraq will be on the way to forging an actual democracy; the war will have been effectively over and Al-Qaeda will have been defeated. This is not to say that critics are incorrect when they attack the serious mishandling of Iraq after Saddam’s ouster. No one can justify Abu Ghraib, the excesses in interrogation techniques and the sanction of actual torture, or the problems at Guantanamo. Nor can one fail to be critical of the President’s inability to explain to the American public why Iraq had to be won and why they should support Operation Iraqi Freedom. Future generations will have to assess the final outcome. If Iraq does emerge as a democracy in the Middle East, joining Israel as a state pledged to democracy in a sea of tyrannies, then future historians will see the President in a more favorable light than their contemporaries seem to do today. Whatever their conclusions turn out to be, I have one prediction: Bush’s position in the rankings of American Presidents will have risen close to the center. Check back with me in a decade. I think it may take longer than a decade, and in any event it will depend on the future course of Iraq and the Middle East. Today, after mismanaging the war for years, Bush can point to a tenuous, fledgling democracy in Iraq. Twenty or forty years from now, if things go well, he may — may — get credit for creating the first stable democracy in the heart of the Arab Middle East. And if Iraq becomes a beacon of hope in the neighborhood, the missteps in the early years of the war will become a mere footnote in the history books. This entry was posted in Uncategorized and tagged Bush, Derangement, Iraq by Kirk Petersen. Bookmark the permalink. You’re just focusing on Iraq, Kirk. You have to also remember his failures on the domestic agenda too. Katrina, the Attorney General scandals, etc. Worst President ever? Maybe not, but certainly in the bottom three. Ah, but Iraq is the key. For better or worse, Iraq will be the dominant theme of his legacy. If, forty years from now, Iraq is a stable U.S. ally and a force for moderation in the neighborhood, the fact that the early years of the occupation were mismanaged will be a dim memory. The war will be judged on what it accomplished and on the extraordinarily low level of U.S. casualties. 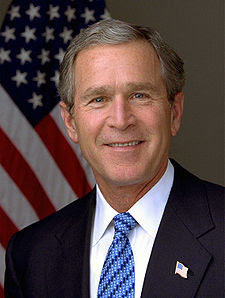 I’m not trying to put Bush on Mount Rushmore. I’m just saying it’s far too early to proclaim that he’s the worst in history — he’s not even “in history” yet. The only thing that can be said for certain is that George W. has been the most unpopular president in history (to date). I read American Gospel by Jon Meacham and something he said resonated with me. He would not go further than Ronal Reagan in his research because, as he put it, the Beschloss Rule should apply – Michael Beschloss believes that “only after twenty or thirty years does one begin to have enough information to evaluate a president.” I think that’s a very good rule to apply. Emotions, good and bad, cloud our judgment when we’re closely embroiled in a current president’s record. Exactly right, Lori. The Berlin Wall didn’t fall until after Reagan left office. When he left office, things seemed to be on a positive track with the Soviet Union based on a minor arms agreement, but the Wall still stood, and Reagan was under the cloud of Iran-contra. I voted against him twice, but 20 years after he left office I consider him the greatest president of my lifetime (which goes back to Eisenhower). That’s a big “if” for Iraq to become a beacon of hope, or whatever. I wish that country well. Just remember, before our invasion, George Packer wrote that it is the most fractured country in the Middle East. I say, right now, the future of Iraq is as uncertain as ever. We have to see what happens after our troops leave.